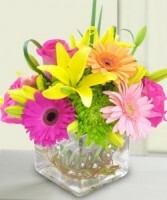 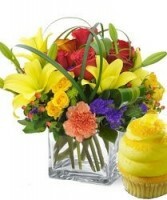 This bright floral arrangement just screams " Choose Me"! 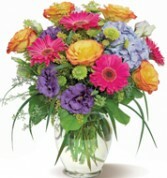 It has roses hot pink Gerber Daisies,blue hydrangea,Green button mums, all pulled together with a splash of purple. 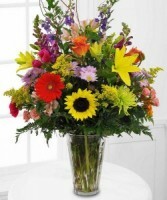 Vase Arrangement of summer' brightest, most brilliant garden flowers. 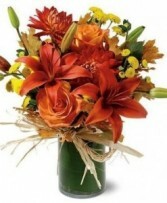 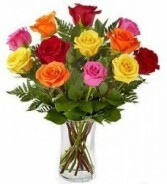 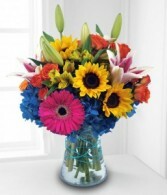 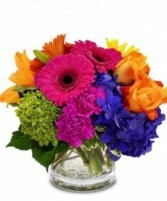 This Includes hydrangeas,Gerber Daisies sunflowers., & bright colored spray roses This is an excellent selection!